Smoky Chick Kale Salad with Miso Dressing – Olive For Greens. Chick peas and kale are an excellent sources of protein. This is a hardy, filling salad breaks barriers that claim salads are boring. Although the salad dressing is easy to make, most people don’t have these ingredients in the kitchen. So, if you want to use your own salad dressing, go for it! Add all of the salad dressing ingredients to a blender and set aside. 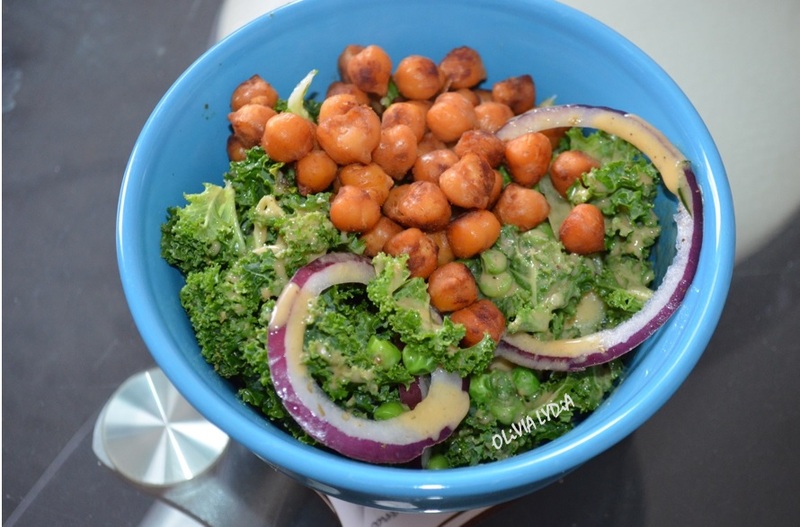 In a large mixing (or salad) bowl add the kale, onion, peas and cucumber. Next, add the olive oil and oregano. Set aside. Lightly coat a medium pan with coconut oil. Add the chick peas, tamari and liquid smoke. Give it a toss then turn the fire on medium. When the liquid dissolves, a stir constantly for about 10 minutes then simmer for 2-5 minutes- or until the peas are toasted. Pingback: Roasted Carrot & Tzatziki Sandwich – Olive For Greens. Pingback: Baked Wonton Ravioli with Cashew Alfredo – Olive For Greens.